→ New old music - part 11: "The Wrecking Crew"
New old music - part 11: "The Wrecking Crew"
This is part movie review, and part music review. Because it's a review of a movie about music. A few years ago, I'd heard there was a documentary in the works about The Wrecking Crew. I waited years for it to get released, as it was hung up in trying to get the rights for all of the music it contained. But finally, a successful Kickstarter campaign pushed it over the top, and last year it finally got released. This may not mean much to most people, since they don't know what The Wrecking Crew was. Well, that's largely the point of the documentary - to tell this amazing story. I knew of The Wrecking Crew because, as a fan of The Monkees, they were a prominent part of the history of the Monkees, and a critical part of their success. So... who were they? Simply put, they were the studio musicians that largely defined the sound of pop music of the 60's and early 70's. And by largely, I mean hugely. The Monkees were "outed" in a sense, for not having played the instruments on their first two albums. Well of course they didn't - those albums were essentially soundtracks for a TV show about a band. They weren't intended to be anything other than products. And when you're creating a product for mass consumption, you manufacture it. And the way pop records were manufactured in the 60's, was often by bringing in professional studio musicians to lay down the instrumental backing tracks. Thinking back a little bit - of course that makes sense. Especially for vocal groups. Someone had to lay down tracks for Sonny and Cher, or The Mamas and The Papas, or the Everly Brothers, right? There you go. But it went beyond that. It's pretty well known by now that Brian Wilson used studio musicians on a number of Beach Boys albums - notably Pet Sounds. Other groups did too. Why? Because time is money, and some of the bands of that era, while capable musically, weren't full-on professionals, hopping from recording gig to gig 12-16 hours a day, day after day. The Wrecking Crew could knock out backing tracks in a fraction of the time that a typical pop group could, and could do it to a much higher level. They didn't just play the music though. They helped create it. Often shaping it. Adding to it and improving it. Just how much came as a surprise to me the first time I watched The Wrecking Crew. I thought I knew a little about them... but I had no idea just how much they shaped the music of that era. I'd get chills as a musician would play a melody, riff or bass line from some classic song that they'd originally recorded back-in-the-day. Highlighted and brought to the surface, I began to see just how much they contributed to the music, and all without most people ever knowing it. One of the surprising things about that anonymity - is that they're all pretty okay with it. They got paid (and paid well) for their work. Each project was a job. They did it, and moved on to the next. In some cases, playing on number one hits, songs of the year, and doing so occasionally without even knowing who was going to come in later and lay down vocals over it, only later hearing their finished work on the radio when it was selling millions of records. It's all incredibly fascinating stuff. An amazing glimpse into the world of making records. The documentary was written and directed by Denny Tedesco - the son of the late, legendary guitarist Tommy Tedesco. Oh, speaking of TV... ever watch M*A*S*H? Bonanza? Green Acres? The Twilight Zone? Remember the theme songs? Yeah, that guy. And he's played on countless other TV and movie soundtracks. Some speculate he may be the most recorded guitar player ever. Just on M*A*S*H reruns alone, he's probably had his work played more often than anyone. And he's just one of the amazing musicians profiled in this documentary. Sadly, many of them have passed away as this documentary was originally started back in 1995. But even though they didn't live long enough to see the completion of the documentary, we're still fortunate enough to get to hear them tell their incredible stories. I rented the documentary when it was first available on iTunes a year ago. Then I watched it again when it aired on AXS. And I watched it again the other night on Netflix. I think at this point, I might as well buy the Blu-ray. Since I know I'm going to watch it again. Plus I want to watch the bonus footage now, too. The Wrecking Crew gets my absolute highest recommendation. I even watched it once with my folks - and they loved it too, even though they weren't into 60's or 70's pop music. But they do love music, so they were completely fascinated by it. 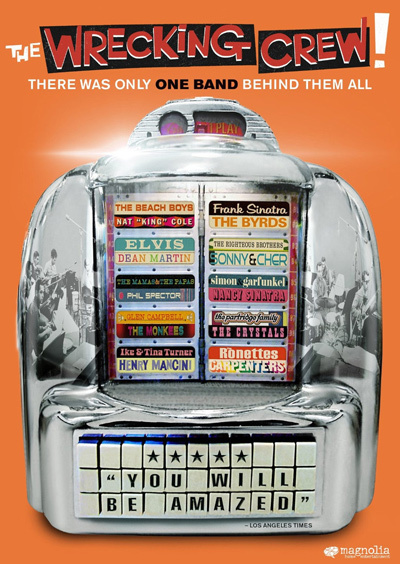 If you love music, you need to watch this film. It's on Netflix, or available to rent on Amazon Prime and iTunes. Or buy it on DVD or Blu-ray. And check out Rob Nichols' Wrecking Crew playlist on Spotify sometime. The Wrecking Crew gets a 10/10. Check it out. As a follow-up, I saw another excellent music documentary recently: Sound City. Directed by Dave Grohl (Nirvana, Foo Fighters), this recounts the rise and fall of a legendary recording studio in Van Nuys, California, and covers a lot of history of the music business of the 70's through the 90's. Features a veritable who's who of rock icons, including members of Fleetwood Mac, Nirvana, Tom Petty and the Heartbreakers, and many more. Fascinating stuff, and well worth renting (VH-1 Classics has also aired it).